Now you KNOW I LOVES me some wings. Bone-in, bone-out, bone-less, bone-whatever. 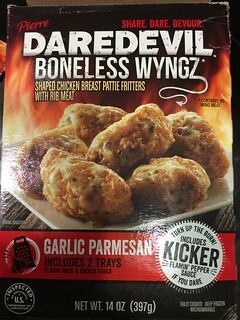 One of the great flavors for wings is Garlic Parmesan…so when I saw these in the freezer at Walmart I was interested. Two trays of microwaveable “wyngz” with “kicker” sauce if I want it extra spicy? Hmmmmm…..go on. Well fresh from my microwave these were NOT good. They were soggy and chewy and did I say NOT good already? Having most of my afternoon free, I decided to go ahead and fire-up the oven and cook these suckers ol’ fashion style….and that result was way better…duh. I enjoyed the flavor of the kicker packets and the garlic parm sauce as well. I would for sure buy these again…but I would never microwave them again. woof. Oh….my….lord…are these instantly addictive. WOO!! It’s such a deceptively simple idea. Frozen banana slices in dark chocolate with some almond pieces on top. Four slices to a bag. These frozen bites are sooooo good. 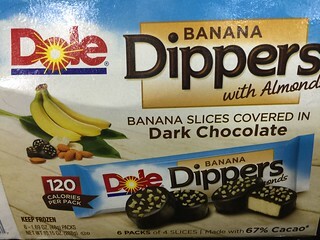 Banana and dark chocolate are a fantastic flavor blend as it is, but those almonds really do kick it up a bit. My new favorite snack!! 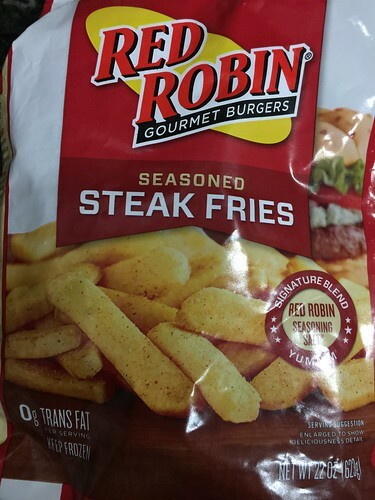 Red Robin is known for having these crazy-good french fries. They are also known for said fries to be “bottomless” so you can eat fries at their restaurants until you pass out. As tempting as that sounds I have been to Red Robin only once and I didn’t remember their fries as being anything THAT much different from any other restaurant fries. I mean they were good and all. I didn’t even know at the time I could have refills. My server wasn’t the best so I actually haven’t been back. So when I saw these in my freezer section I thought it was time to give them another go. There is some good seasoning on here but the fries themselves came out very uneven. Some were over done and some were under done. I baked them in the oven and I think that was the problem. My next attempt will be to fry them up and see if I can truly recreate their signature item at home. Good Lord, if you didn’t have a complex about yourself before…. 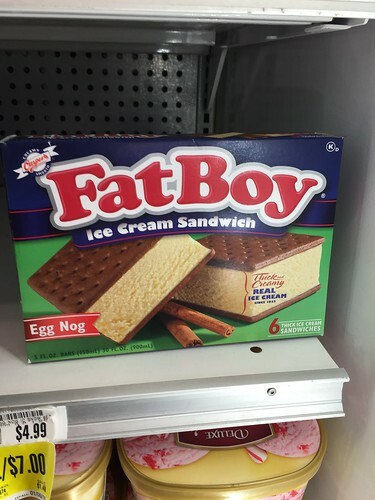 Does this fall into the “you are what you eat” category? In all my years on this planet, I have never had the Totino’s classic Pepperoni pizza. Don’t ask me why. 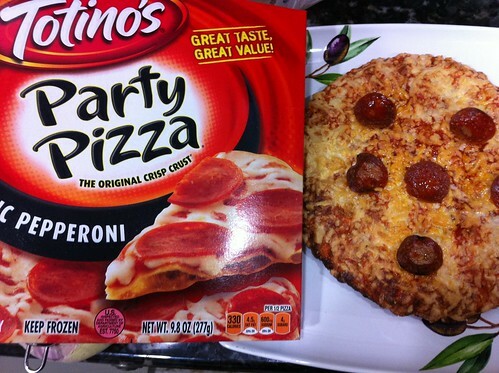 I have had their other flavors …just not pepperoni. I do know…now…that I will never buy another one again. Look at that mess. There were five pepperonis on the ENTIRE PIE. 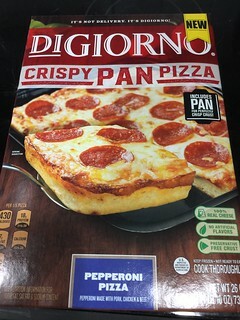 Even the slice on the cover has more pepperoni than I did. This should be against the law or something. Hell….looking at it now it seems more depressing and upsetting than it was when I first laid eyes on it. Totino…whattaya doin’ to me, kid? We are in the platinum-age of frozen foods. 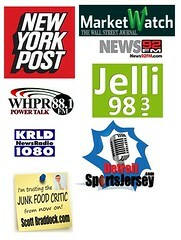 The products coming out now are so much better than when we were kids. Most of them are so close to “restuarant-style” quality now…it’s quite impressive. 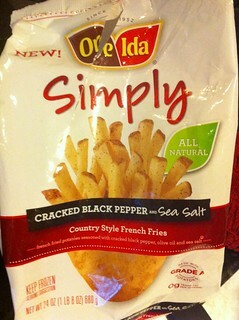 Take these new SIMPLY fries from Ore Ida. These are all-natural with cracked black pepper and sea salt. They are long, thin, and look to be fresh-cut potatoes. Or “country-style” as noted on the bag. Only frozen. I usually cook these in my fryer – but since I was low on oil, I baked them as per the instructions. They still came out great but can’t help but wonder if they wouldn’t be truly fantastic fried. So that is my next batch out of this bag. Probably one of the better frozen foods I have had in the last few weeks. Ore Ida just keeps cranking out some good stuff lately! !